The two most important considerations when choosing ventilation for your kitchen remodel are noise and suction power. It's also important to work with your design-build-remodeler to find a range hood that fits your new kitchen design. It's not the star of your kitchen, but your range hood is the unsung hero! Ventilation is one of the most important considerations when it comes to remodeling your kitchen. Whether you're installing a professional chef's range, or an island cooktop, your range hood can make the difference between a kitchen that merely functions and one that excels! Without proper ventilation, even the most beautifully designed, custom-appointed, perfect kitchen will have issues. When you cook, the smoke odors and particles released can hang in the air without proper filtration. This is especially critical in an open concept home. Odors can lodge in drapes and furniture, particulate material can end up on shelves, and floors. Choosing the proper range hood can eliminate these issues. A range hood is designed to remove smells, smoke and particulate material from your home. • Providing focused light over the cooking surface, making floor preparation safer. • Helps to keep your kitchen cleaner. By removing smoke and grease kitchen cleanup is faster and easier. • Proper ventilation can keep your family safe by reducing carbon monoxide which can build to dangerous levels if you have a gas range that is not adequately ventilated. • Proper ventilation can help to keep your kitchen cooler. Along with smoke and odors, ventilation removes excess heat from the kitchen. • Even if you don't cook every day, your range hood can add value when you sell! Today, along with the technical needs of proper ventilation, choosing your range hood today is as much about aesthetics and artistic design as functionality. They not only provide the benefits listed above, but a beautiful range hood can also serve as a focal point in your design and an extension of your style and taste. 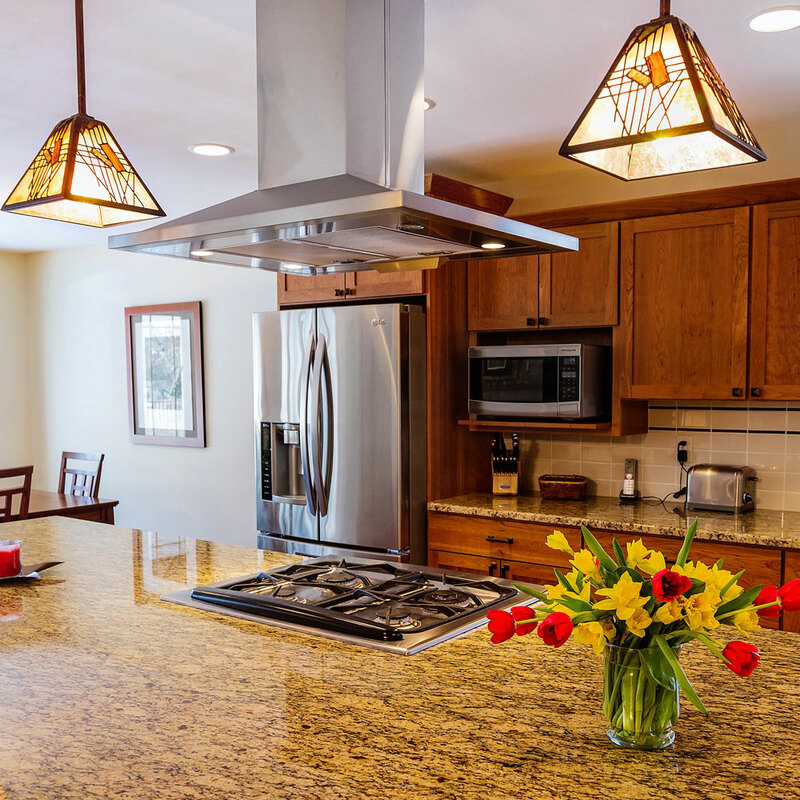 Here are five things to consider when selecting a range hood for your kitchen remodel. When choosing the power and size of your range hood, the size of your stove is the key. A larger stove will require a larger hood. The more BTUs the stove generates and the amount and type of cooking you do are all important considerations. Often your stove manufacturer will have recommendations as to the amount of ventilation needed. Range hoods are measured by the amount of air the can pull from a given area. This is measured in cubic feet per minute or CFM. The Home Ventilating Institute (HVI) recommends a minimum of 40 CFM for a hood mounted against a wall and 50 CFM for an island hood. Of course, you should take into account the heat output of your stove and the size of the kitchen and the hood itself. Base your purchase on the highest CFM after calculating each of these requirements. The HVI recommends taking your stove's BTU rating and dividing it by 100. For example, a 30,000 BTU would require a minimum CFM of 300. Your range hood should cycle the air out of your entire kitchen 15 times per hour. To determine this number, multiply your kitchen's dimensions (floor area sq. footage X ceiling height) to determine volume, then divide that number by 4. For a hood over an island, multiply the minimum CFM by 1.5 and if you install a professional chef's stove, follow the manufacturer's advice for proper ventilation. This range hood was right-sized for the gas cooktop which it serves. PRO TIP: The lower you can place the range hood, the more odors and humidity it will be able to remove, using a lower fan speed. As you draw air out of your house through the range hood, make-up air has to enter from somewhere. This can be air coming in properly through your HVAC system’s outside-air intake system. It can be through leaks in your windows, doors, or even your walls, ceiling, and floor system. Or it can be coming backward though your dryer, your fireplace chimney, or your water heater or furnace chimney. Those, obviously, are bad! Therefore, building code dictates that range hoods over 300 CFM have a dedicated make-up air system, which become very expensive to install and operate. These units, when installed properly and in compliance with building code, will require electric heat to warm the incoming air when operating the range hood in winter months. These complexities add quite the expense to a high-CFM range hood. For the vest value, it is important to install a range hood that is no larger than you need to have. A simple non-vented, recirculating hood can be found in the $200 range, with a couple of speed settings. Generally the offer less than 200 CFM. You'll pay more for fans with speeds exceeding 200 CFM and may also include air chambers and fans designed to reduce noise. As you move into more decorative, quieter designs, with a maximum speed of about 400 CFM and extra features like digital controls and temperature sensors that automatically cycle the fan on and off will take you to the next price level. As you get more into the $400 - $1000 range, you'll find extras like sensors that indicate when the charcoal filter needs to be replaced or the grease filter needs cleaning. Halogen lighting is also standard on more expensive models. While it may be tempting to sink more of your budget into a professional range, or exotic tile, don't skimp on your range hood! An inexpensive hood can be noisy and offer a lower CFM than slightly more expensive models. It is possible for an over-the-range microwave to be an effective vent. The key is that the run of ductwork be short. Be aware that most of these will be noisier than other types of range hoods. If noise is an issue, you have several options available. A larger range hood may allow for a less powerful fan to be used. Another option is using a powerful fan with variable speed control. That will enable you to crank it up when it's needed or to get the initial airflow happening and then back it down to reduce noise. A stronger fan at a lower level would be less noisy. Another consideration is location. A unit that is vented outside and has a fan placed on the exterior of your home will produce less noise. If you're concerned about noise. Fans will carry a noise rating. The unit of measure is called a sone. A modern refrigerator is roughly one sone. This can be difficult to determine, especially with inexpensive hoods which may not carry a noise rating. A quiet fan will have a rating of 6 or 7 sones, which is roughly 65 decibels, or the level of a conference room conversation. Of course, ultimately your choice will be narrowed down by the location of your stove and the size. An Island hood will have to be larger as it needs to draw from both sides of the cooktop. Insert hoods, which are concealed can be useful if you're looking for functionality as opposed to making a design statement. A downdraft hood is installed alongside the stove and is concealable. It is raised and operated by a button and is not a great choice if you're considering a gas range. They're more applicable if you're using an electric range or induction cooktop. If you can not install ductwork to the exterior of your home, a ductless or recirculating hood could be an option. They draw air into the unit and through a series of filters before returning the air back into the room. A ductless ventilation unit is not very effective at removing heated air so you should take that into consideration. The quiet, properly sized range hood in this kitchen is fully concealed in cabinetry. Manufacturers are creating range hoods that designers love, and they've jumped on the decorative hood bandwagon in spades. Designers are creating designs that incorporate these artistic hoods as focal points in the kitchen. The kitchen is a functional, utilitarian space, but it doesn't have to be boring. Including a unique, beautiful range hood in your design can add a focal point, and give you an element that can work to influence other elements, like your backsplash and hardware choices. Stainless steel has always been a popular choice for it's look, function and ease of cleaning. Any porous surface, like wood, can be challenging to maintain and can become damaged when trying to remove grease. Other warmer metals like copper, antiqued brass, and bronze are all easy to maintain choices that can add visual pop to any kitchen design. Range hoods that offer a cast-iron look have recently become popular in Europe. All of the metal hoods can be coated to preserve their original finish or left bare to allow them to develop a rich patina over time. Proper ventilation is the key to a working kitchen, and your design-build team can help you to choose the right type to meet your needs with the perfect aesthetic to match your unique style. If you're considering or planning a kitchen remodel, talk to our design team. Degnan Design-Build-Remodel can help you to design your dream kitchen including the perfect ventilation system.